Not very long after the establishment of the class, an article appeared in the respected and widely-read Australian magazine The Australian Motor Boat and Yachting Monthly. In the February 1926 issue, a critical appraisal of the 21s attempted to put into perspective the attributes of ‘design’ of the class, although it should never be forgotten that as a restricted class, the design could vary greatly within the set down restrictions. The truth was, however, that experimentation with bow and hull shape with regards to getting the most out of waterline length had already been tried. Royalist was designed and built in 1923 for the Royal Yacht Club of Victoria and became the prize of a fund raising raffle. Designer and builder Jack McKenzie was following the lead of some of his Sydney counterparts when he built the boat with a long and low overhang at the bows, ending in the very ‘snout’ alluded to above. The same magazine in which the call went out for better design early in 1926 had, only four months earlier, described Royalist as ‘generally regarded as a freak boat, by reason of her departure from the ordinary features which it was understood this class would develop’. Royalist had, however, been scooping up a great deal of the prizes in her home waters, and yet it was conceded that she was ‘not the equal of some of the Sydney boats’. Of course there must have been some limitation to the advantage gained from an increase in weight. The restrictions allowed for a minimum, inside only, ballast of 10cwt, so that the extra ‘live’ ballast from the six crew must have been handy. But the maximum allowed deck length of 25ft must have put a limit on the waterline able to be gained from a heavy crew, and indeed the winning crews as seen in the available photographs do not really appear to be overly heavy (although with six on board and with a cockpit restricted to no more than 42 superficial feet, there must not have been scope for too much dashing around). 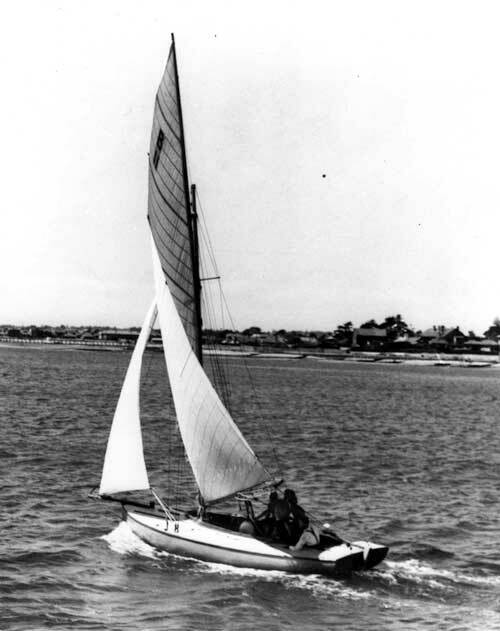 The gunter style of rig seemed to stay in vogue for years, as can be seen from the photo of the 1951 Forster Cup heats (the first picture at the top of the lead article) but it seems that the Marconi or Bermudan rig had been tried years before. That the gunter remained the preferred rig can either be attributed to a stubborness on the part of sailors or to the fact that, with the larger tolerances inherent in the rigging used over this time, the gunter really did perform just as well. Topsy D, by the way, did no better than most of the 1930 fleet, and in fact regained the gunter main after being sold to a Geelong owner (sail number G12 in the 1951 photograph). Daggar type centre plates came in for some tough criticism in 1926, being descibed as ‘the worst feature, totally unsuitable for the type of boat, most ineffective for their area, and cumbersome to work’. By this time, a lot of the boats were experimenting with either the daggar plate arrangement or a swing-plate. Harry Clark says that most of the earlier 21s had plates that swung on a king bolt, ‘like a couta boat’, he says, but a lot had a daggar plate which just dropped down. ‘The Sydney boats came down here with daggar plates,’ Harry says, referring to the Forster Cup races held in Melbourne in 1924. ‘It took two men to work them, one to lift it and another to put the pins in to hold it wherever it was needed.